In the 1950s Edward Teller, the co-inventor of the H-bomb proposed using "the great and violent power" of the atom bomb for peaceful purposes. NUCLEAR DYNAMITE explores the Soviet-American race to develop nuclear explosives for gigantic megaprojects. Scientists planned to harness the power of the bomb to launch huge spaceships, dig an instant harbor in Alaska, blast out oil and gas deposits, cut through mountain ranges, and dig a new Panama canal with 300 explosions. More than 150 nuclear blasts were carried out between 1958 and 1988 before this bizarre and extraordinary atomic dream was destroyed by the emergence of the environmental movements in both countries. Note: This documentary has been released in two lengths, at 52 and 72 minutes. The shorter version is designed for educational and group use where time is limited. While maintaining the same story outline, the short version trims or eliminates a number of stories, side bars and discussions. The long version is designed for film festivals, discussion groups, and higher education. It includes more examples of the use of "peaceful nuclear explosions," a broader discussion of the "atomic culture" of the 1950s and a longer discussion of the environmental consequences of nuclear and biological technologies. * "Atom and Eve" and other examples of 1950s films promoting atomic technology. * Putting out a gas well fire with a nuclear explosion in Uzbekistan. 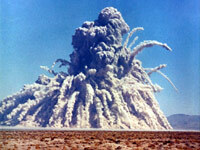 * The first Plowshare explosion in New Mexico in 1961 leaks radioactive steam. * US development of "row charge" explosives for the Panama project. * An extended debate by Edward Teller, John Gofman, Ursula Franklin and Barry Commoner about the parallel issues raised by nuclear and biological technologies. "Absorbing docu digs up declassified footage to explore a threat that ran quietly alongside the Cold War weapons race. The expertly assembled Nuclear Dynamite looks back on 30 years, now almost forgotten, in which the U.S. and the Soviet Union competed to find the most dramatic peacetime use of atomic explosions." "Using priceless old footage and modern-day interviews, filmmaker Gary Marcuse reconstructs this anything-goes attitude scientists and governments adopted toward health risks." "Important and timely, Nuclear Dynamite recalls a fast-fading epoch of the world's nuclear history. Together with the documentary Atomic Cafe, on the government propaganda and popular culture of the early nuclear age, and such commercial films as The Day the Earth Stood Still, On the Beach, and Dr. Strangelove, it would wonderfully enrich courses on postwar America or on the nuclear era...Highly recommended." "Nuclear Dynamite is like the bomb itself, both horrifying and immensely interesting...(It's) humourous, suspenseful and makes a good argument for testing the effects of new technology before experimenting with it on a major scale...As a good documentary should, it allows the interviewees to speak for themselves, and leaves the audience to decide if they agree." "Documentary filmmaker Gary Marcuse combines science and history as he revisits the era of 'peaceful nuclear explosives,' and how it led to the stirrings of the environmental movement that forced governments to ban nuclear testing."